Upon Sherwood's appointment I couldn't help but feel that there we were reluctantly surrendering our season. We sought damage limitation. We were admitting mistakes that we didn't really know were mistakes. I pictured Levy & Baldini dragging their heels to weekly FIUA (Fucked-it-up-anonymously) classes but at the same time easing their hollow tears with balance sheets and and continued joys at sanctioning the sale of the World's most expensive player. It was us as fans that felt betrayed. With underlying issues still plaguing the club behind the scenes, the results on the pitch have temporarily masked our sincere dismay in this rather extraordinary season. It's disappointing that we weren't involved in FA Cup at the weekend and the game against Arsenal left me with an overwhelming sense of confusion. We found ourselves easily overrun. We didn't pack the midfield. The script was well and truly written and published before a ball had been kicked and it left my vague hopes of a run in the FA Cup in tatters. A month or so in football can prove a long time. Despite one Les Ferdinand's admission that Sherwood hasn't changed, it appears that his approach certainly has. "I keep finding myself coming in here and saying the same thing” Sherwood said after the Everton game. “We started slow again and we have got to find out the reason why. We have got to address it because we started slowly against Man City and we were out of the game. It could easily have happened again today." I like the pragmatism here. The idea against Everton was to press them. The execution didn't quite follow-through the plan although the signs were definitely looking prosperous. Although we played poorly I finally took some heart at what Sherwood had to say. Many of his press conferences had caused great anxiety amongst us. His seemingly growing admission of struggling to find the value in implementing a holding player had real cause for concerns but as the weeks progress it seems that a lot of this is all fart and no poo. With Capoue in the side we've looked far more assured and allowed others to operate with more freedom. Although we've still struggled immensely in operating a system that can exploit the best of our players. We don't even know our strongest XI yet. With so many new arrivals and with a few returning from injury, it'll be likely that we'll continue to rotate a few to see what works. There was lots of energy against Everton but we struggled in big patches to harness it efficiently. We were a team of Lewis Holtby's. We couldn't really find a killer touch and it was thankful that some quick thinking from both Walker and Adebayor broke us free from the jail cell we were building ourselves in. The Newcastle game came around and the line-up immediately presented Sherwood's willingness to adapt and test. A team with 4 central midfielders and one naturally wide player operating in a 4-3-3 emphasising a more thorough pressing game. There's no way that the personnel selected would be unable to do that. We squeezed the space far more than we did at Everton. Despite Newcastle missing some key members and being atrocious we didn't allow them too much of a sniff. Hugo Lloris ensured that we weren't punished for allowing them one or two exceptional chances in front of goal. It was reinvigorating to see both Kaboul and Vertonghen starting although it was evident that the pair will need game-time to realise their potential as a partnership. I'm never a big fan of Dembele in a more advanced role. Despite Fulham signing him from AZ Alkmaar as a forward player, I've always preferred him to be our rock in the middle. His ability to win tackles and break from midfield facilitates a lot of our attacks in the final third. He was ineffective against Everton in a more advanced role and felt he was wasted although against Newcastle showed a far more efficient performance. Sherwood's ideal of having a forward three pressing from the front and grabbing the game by the lower regions early on provides far more confidence than his early days at Spurs. But why bloody why didn't we test this against Arsenal? 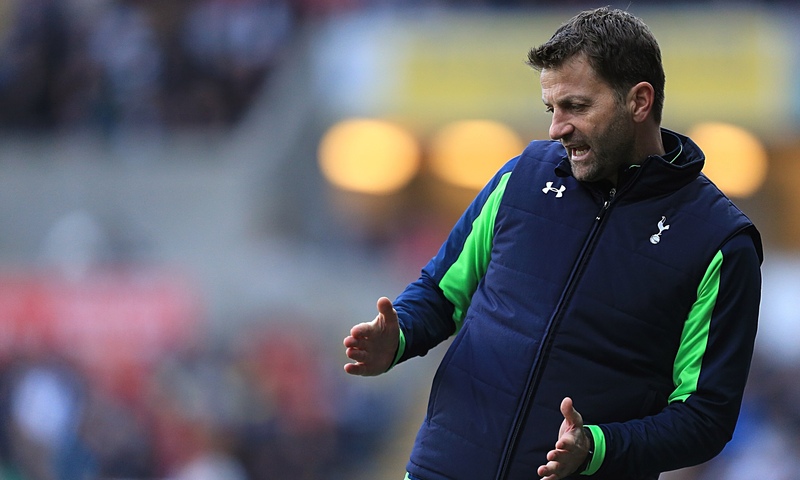 A steep learning curve seems to growing up through Sherwood's spine and we're reeling of the effects on the pitch. Bentaleb another that has grabbed his opportunity in most of the fixtures he's featured in. Nothing overwhelms him, nor do you feel an injustice that he's playing in more or less every fixture. He's slowly adding value and no longer the bystander that I initially felt he was. If we never take risks with our youth players then we'll never know the potential that they have to unlock. Granted he cost, at the time, a great fee - we never would've realised Gareth Bale's potential had we not persisted with him. There's little footballing point in investing in a youth system if we're not willing to give those coming through the chance to prove their worthy enough to wear the famous shirt. I like that Bentaleb is positive in his play. His confidence is growing by the fixture and on the ball his offensive passing has been brilliant. He's not nearly the finished article, but he seems to have a wealth of attributes in his locker. Naughton on the team sheet usually leaves you with sweatier palms and shorter nails than usual but his performance was solid. He looked very assured at left back and it was positive to see him have such a positive game in Danny Rose's absence. It'll do his confidence, and ours, wonders. Despite there being no natural creative outlet, we managed to engineer some very good chances. The passing and movement between the lines was exceptional. There was a lot of ethos in the side and we restricted Newcastle to a lot of high and hopeful balls from the back - something we can be rather accustom to. I've always felt that we suit playing away at sides with larger pitches as we find we have more time on the ball. We were creative as a side and this wasn't pinned to just one individual. We finally looked as though we were all on the same page. This is in no way a dig at Eriksen, I've grown to be one of his biggest plaudits this season and the team vs. Newcastle highlighted the real depth we have in our side. Sherwood’s built a wall between comparisons of himself and Redknapp and it's positive to see that he is proving far more astute than initial perceptions suggested. The performance gave me faith in regards to other key fixtures. I no longer feel as though we're surrendering our season but approaching it without the weight of expectation. We're expressive yet disciplined. We're fluid yet professional. We're hoping but not expecting. I'll still have those pessimistic fears and concerns at the fixtures away at the likes of Liverpool and Chelsea, but at least we're setting ourselves up with a far better chance than we would have had just a month or so ago.